PG&E, California’s biggest utility provider, said on January 14 that it intends to file bankruptcy as a result of its potential liabilities tied to last November’s deadly California wildfire. Last week, a new finding from the California Department of Forestry and Fire Protection concluded that the California utility wasn’t responsible for the 2017 Tubbs Fire, the second-most-destructive fire in the state’s history. Spurred by the new finding, a group of hedge funds, including Paul Singer’s Elliott Management, has sent PG&E a $4 billion financing proposal that could keep it from bankruptcy. PG&E, California’s biggest utility provider, reportedly received a $4 billion plan Monday to keep it from filing for bankruptcy as a result of its potential liabilities tied to last November’s deadly California wildfire. Shares were up as much as 20% following the news before returning to the flat line. A group of hedge funds, including Paul Singer’s Elliott Management, has sent PG&E a financing proposal backed by convertible notes maturing in about five years, Bloomberg reported, citing sources familiar with the matter. At least one other group, that includes Ken Griffin’s Citadel, is pitching a competing financing plan that would save the company from bankruptcy, Bloomberg’s sources said. Citadel is among the biggest shareholders of PG&E, owning a 0.55% stake. On January 14, the company said it intends to file bankruptcy petitions at the end of the month to reorganize under Chapter 11 protection — two months after the deadliest and most destructive wildfire in California history broke out. PG&E said it was having trouble with its transmission lines when the blaze erupted and that it may be responsible. In a filing dated on January 21, the utility said that it has lined up $5.5 billion from four banks — JPMorgan Chase Bank, Bank of America, Barclays Bank PLC and Citigroup Global Markets — to provide debtor-in-possession financing for its operations during the bankruptcy process that it expects to take about two years. BlueMountain, one of PG&E’s largest shareholders, recently spoke out to challenge the bankruptcy plan, arguing that it was „damaging, avoidable, and unnecessary.“ BlueMountain owns a 0.83% stake in the utility, according to its most recent disclosure. 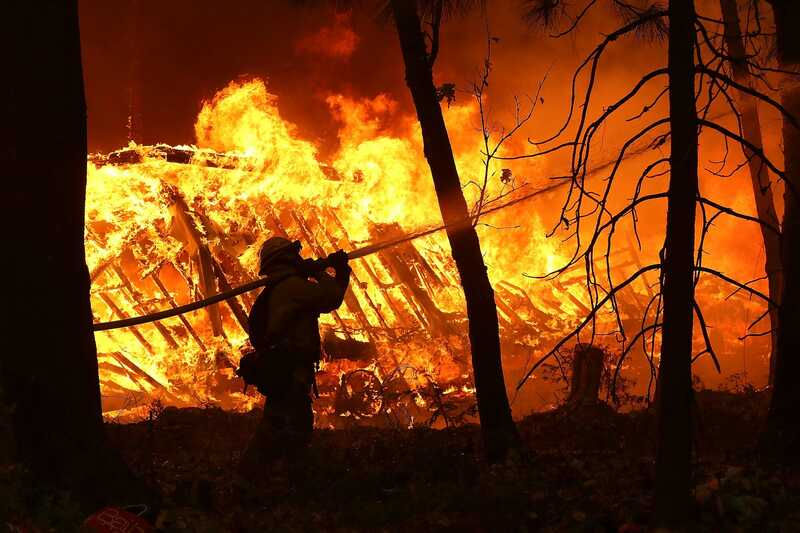 Last week, a report from the California Department of Forestry and Fire Protection (CAL FIRE) concluded that the California utility wasn’t responsible for the 2017 Tubbs Fire, the second-most-destructive fire in the state’s history. That was „another example of why the company shouldn’t be rushing to file for bankruptcy,“ a representative for BlueMountain Capital Management said on Thursday. But PG&E said it still „faces extensive litigation, significant potential liabilities, and a deteriorating financial situation,“ despite of the new findings, according to a statement seen by Reuters. The CAL FIRE report spurred some investors to seek financing proposals that could provide PG&E with time to seek solutions to current and future wildfire claims, such as legislative relief, Bloomberg reported. That group includes Pacific Investment Management, Apollo Global Management, and Davidson Kempner Capital Management. 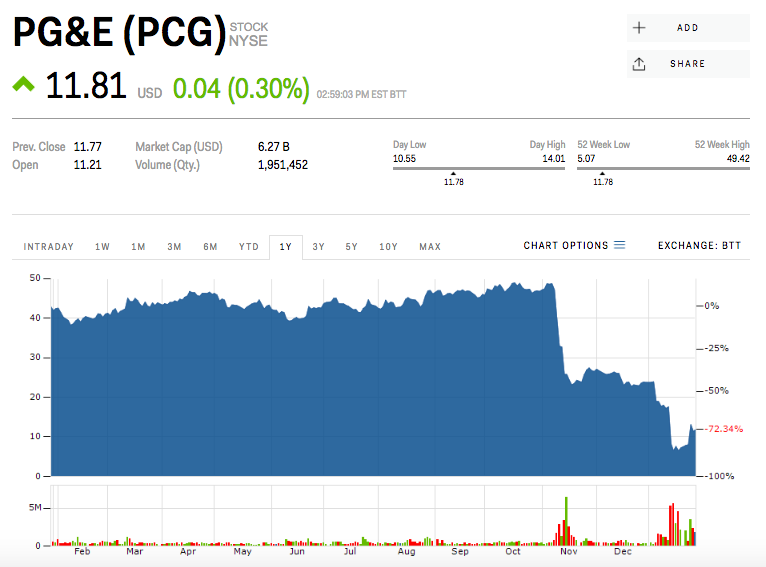 PG&E was down 72% in the past year.